Across the entire scope of human history, there may be nothing more constantly present, regardless of time or locale, than this defense of the status quo: “Why do we do it this way? Because we have always done it this way!” Our very human love of predictability, and perhaps even more of ritual, have set among us a great many structures that easily fit into that process I introduced last week, Instruments that have become Institutions. Some, like Federal welfare departments, are under sufficient duress from enough people that the ideal of actually eliminating one seems tantalizingly close to possible. Others, like the Pa. LCB, are understood to be pointless relics by just about everyone, but remain somehow resistant to dismantling. Then there are those institutions so deeply ingrained into our everyday lives that we literally never think of changing them, unless something major comes along, and often not even then. Religions are the most obvious example, but secular governments are not far behind. Just about every American wants to change the U.S.A., but few want to eliminate it (even Clive Bundy was just blowing smoke, to cover his legal debts). The occasional western county tries to secede from its state, because they believe in democracy up to the point where their conservative ways no longer hold sway over the rest of the state, then not so much. Nothing comes of this, of course. Any U.S. territorial subdivision that has survived thus far can be the focus of much controversy, but can also pretty much count on no one questioning whether or not it should exist at all. 1. Does the reason for which the Borough of West Conshohocken was created still exist? 2. If not, shouldn’t the whole thing be eliminated? Last week I said these two questions had wide applicability, and I meant it. I recognize no sacred cows as exempt from the basic scrutiny that we should apply to all institutions, particularly those that have an automatic call on our money. If the answer to the first question is “No,” then the second question is legitimate. Everybody seemed to agree when the subject was the Pennsylvania Liquor Control Board. Now I’m going to briefly point out why the same answer of “No” applies to West Conshohocken. This is not about what most people would point to: West Conshohocken’s declining population. The Borough has always had the smallest population of any town on the lower Schuylkill; those numbers peaked in 1930 at 2,579, and have declined since. As of the 2010 Census, only 1,320 people still call West Conshohocken their home. For a sense of perspective, consider that at any given daylight hour, there are more people than that at the King of Prussia Mall. But numbers alone are an insufficient reason to question the Borough’s continued existence. A great many towns with smaller numbers exist all across the country. Of course, they tend to be surrounded by large swaths of farmland, not big-city suburbs with a population density close to—or perhaps greater than—their own. That presents a fundamentally different situation, because those great many towns still continue to be different from their surroundings and continue function differently within them. West Conshohocken does neither. If we remain at a general level, the story of West Conshohocken is simple. The Borough came into existence for the very same reason as the seven other towns on the lower Schuylkill and, I expect, a great many more towns all across the country. Only the specifics differ. This particular locale had seen people gather for the same combination of reasons as that of other towns along the Schuylkill: a fording location to cross the river and nearby creeks capable of powering the small manufacturing of the times. For a great many years the area was simply a collection of people, an unincorporated village within the Township of Upper Merion. At some point, however, the area’s “leading citizens” concluded that their location had become significantly different from that of the rest of the governmental subdivision to which they belonged. For all eight locations along the Schuylkill between Reading and Philadelphia that evolved into towns, West Conshohocken most definitely included, this meant they had become focused on manufacturing and commerce, not agriculture. Their leading citizens were active in those occupations and saw the opportunity to add politics to their sphere of influence. Equally important was the fact that the residents of these river locations lived very closely together, and thus were consumers, not producers, of food. As their numbers increased and remained crowded together, these small, unique areas began to need such basic improvements as streets and a water supply. The townships that surrounded these locations, however were rural, meaning their residents lived far apart, working their farms, consuming much of their own agricultural produce and often shipping the remainder no farther than the more densely populated river locations. Within each township, these people had the numbers and the traditional influence that went with working the land. They held the political power, such as it was, and their self-contained lifestyle saw little reason for public expenditures (meaning taxes) on general principles, let alone those to aid just one part of their township. Those leading citizens of manufacturing and commerce at each river location knew that the taxes necessary to construct the necessary public improvements would not be forthcoming from an agricultural tax base. And so they acted, petitioning the Commonwealth to create a new municipality; small, but busy and prosperous. 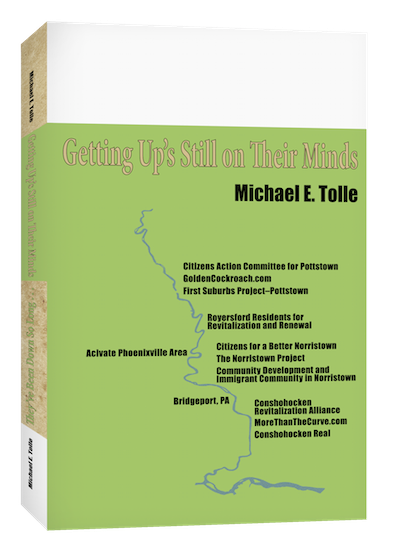 It used to be a lot easier to secede from one locality and form your own, and it was done often (although not often enough, as some devotees of Pottstown history would proclaim). That’s how the other Schuylkill River towns came into being, even Norristown. The Montgomery County seat had been an unincorporated village for twenty-eight years before Norristown incorporated as a borough in 1812. 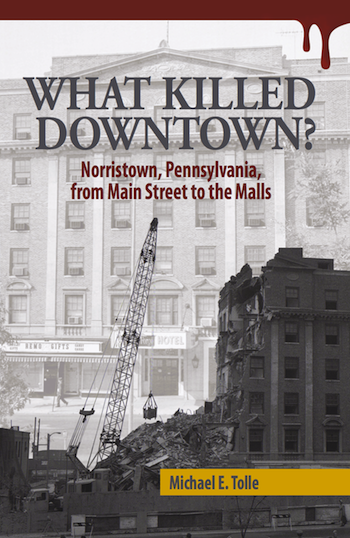 Its status as the county seat did not matter; Norristown’s reasons for incorporation were the same as everyone else’s. West Conshohocken stands out in this regard only because of its late appearance; it did not become a borough until 1874, taking land from both Upper and Lower Merion because, as the West Conshohocken chapter of The Second Hundred Years put it, “residents wanted a separate government suited to the community’s industrial character, which was totally unlike the other parts of the two townships.” Conshohocken, by contrast, had taken this step in 1850. That gave it a major head start, which it has never relinquished. West Conshohocken, despite remaining by far the smallest town on the lower Schuylkill River, managed to carve out its own little niche in Pennsylvania history. As small as it was, its transportation connections—local roads that led to Matson’s Ford, and the railroad along the river itself—sustained an industrial base, and thus a closely-grouped population. Its earlier and much larger neighbor across the river largely prevented West Conshohocken from ever developing much of a commercial district, however. So the Borough lived out its life as a miniature version of an American mill town; hard-working, locally focused and proud of itself. At least it did until about a decade or so after World War II, the 1950s, the sunset period of a golden era of growth, work and prosperity. Then several things began to change simultaneously, and every town on the Schuylkill suffered largely the same fate. By 1980, however, investment money had begun to flow into the area once more. 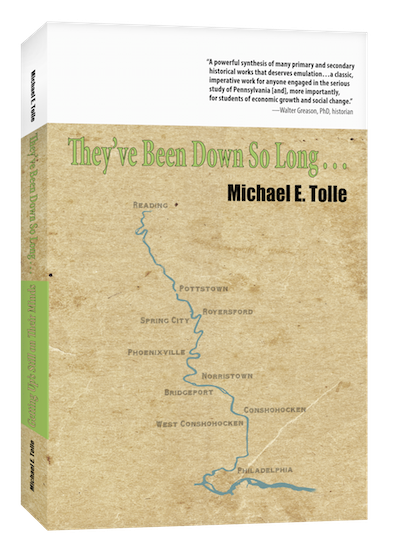 Within a few years it was clear that the Conshohockens had embarked on a very different historical arc from that of the other towns upriver. What was not clear was the price that would be paid, and that West Conshohocken would have to pay by far the heavier one. That price has become much clearer to everyone in recent years, and I focus on that part of the story next week.